Papaya scores the highest in this group, at 20.5 Nutripoints, which is 4 times the recommended value of 5 Nutripoints for a fruit serving. Tropical fruits such as papaya, mangoes, kiwi, melon score the highest in the fruit group. The orange scores 13.5 which is also good, and beats out the banana at 7.5 and pear at 4.5. Raw carrots score the highest in this example, at 35.5 Nutripoints, which is about 2 times the recommended value of 14 Nutripoints for a vegetable serving. Cooked carrots score 30 Nutripoints. Cooking typically will decrease the scores by about 15%-25%. The tomato scores 30.0, which is also good, and it contains Lycopene, a powerful antioxidant in the blood stream which can help prevent prostate and other cancers. Cooked green beans score 24.5, but other "green" vegetables such as the "green leafy" type score much higher. 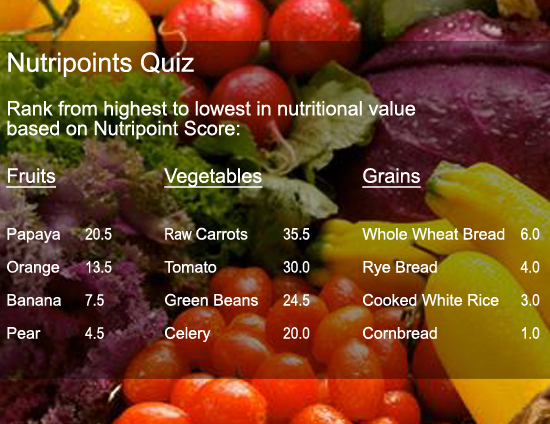 Lastly, celery, which many people think has no nutritional value, scores 20.0 Nutripoints, which is a reasonable score. It scores high because it is so low in calories, the ratio of nutrients per calorie is high.